Triglyceride OMEGA supplements are simply the best way to maintain your pet’s skin and coat health. If your dog suffers from rashes from allergies or skin disease, the Omega-3 fatty acids in Triglyceride OMEGA will provide quick relief. This supplement is rich in Omega-3 fish oils, the same type used by many humans to increase their own health. 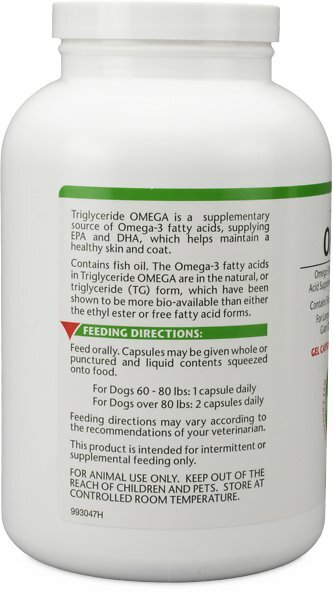 With Triglyceride OMEGA, you will notice a decrease in your dog's scratching and an increased healthy and shiny coat. 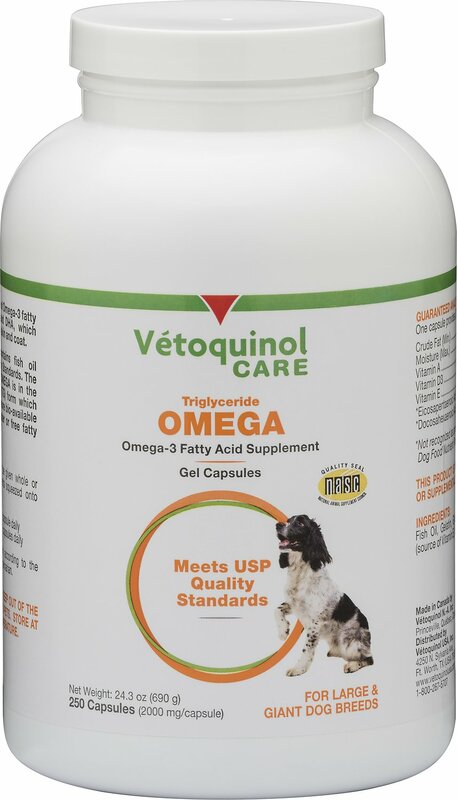 Many dog owners choose Triglyceride OMEGA for increased heart health as well as to help improve mobility and ease joint pain, in addition to relieving the symptoms of an allergic reaction in their pets. 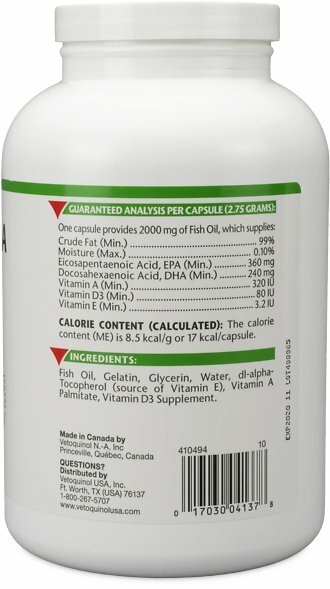 Triglyceride OMEGA contains the only fish oil to achieve USP ingredient verification. Triglyceride OMEGA also makes a great addition to most veterinary prescribed diets for pet allergies. The Triglyceride OMEGA supplement comes in a capsule form that can be given by mouth or punctured and squeezed over food. Several strengths are available, allowing animal owners to determine their needs by the size of their pet. For animal use only. Keep out of reach of children and pets. This product is intended for intermittent or supplemental feeding only. Fish Oil, Gelatin, Glycerin, Water, Dl-Alpha Tocopherol (Source of Vitamin E), Vitamin A Palmitate, Vitamin D3, Eicosapentaenoic Acid, Docosahexaenoic Acid. Feed orally. Capsules may be given whole or punctured and liquid contents squeezed onto food. Feeding directions may vary according to the recommendations of your veterinarian. 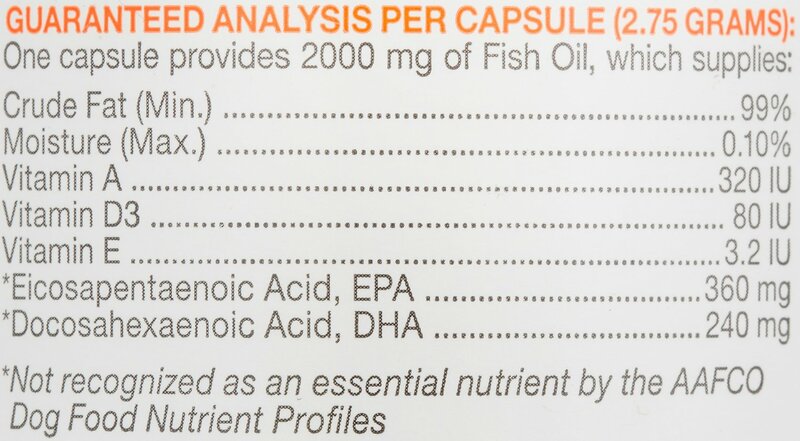 My vet recommended supplementing my older dog's diet (she is now a thirteen year old Pyrenees retriever mix coming in at around 100 pounds)with Omega 3's. Over the past year or so I have seen vast improvement in her skin and ear condition. I would recommend this supplement highly to any one caring to provide relief and comfort and maintain better health in your dogs. My dog has had an ongoing skin problem for months now and I ordered ResQ Organics product along with Vetoquinol Care Triglyceride OMEGA Omega-3 Fatty Acid from Chewy . The combination is working and I do recommend both products. I have a German Shepherd and he needs this as a daily supplement. He plays with it in the beginning and then tears open. He doesn’t ever eat the plastic. My house was one big mess with my Golden Retrievers hair. I was lost... she was shedding like crazy. As I started using this Omega-3 Fatty Acid everything changed. She stopped shedding after a few days. I can say she now sheds like 5% of what she used to. She looks at this large pill as a treat, and she loves it. She's about 80-85 LB and I feed her one pill every morning. i would definitely recommend. 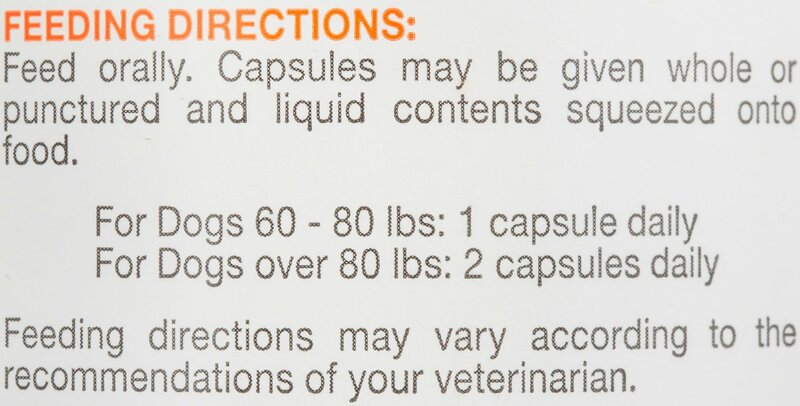 Vet recommended giving these supplements for my Golden's recurring icthyosis problem. Definitely cuts down on the dander. I am very disappointed. It did not work for my dog at all. I have previously purchased this item from a local veternarian. They stopped carrying the product after a 'buyout' (from local vet to conglomerate). After searching the internet, I found the same product on Chewy. My dogs were placed on this product when they began to have food allergies. There coat had become dull in addition to tons of itchy and scratchiness on their part. This product has given them the missing vitamins that they needed to get their furr back to tip top condition. You know the product contains Fish Oil and you know it when the seal is broken!! Very limited ingredients, so you know what you are giving your dogs each and every time they take a pill! Purchased this for my GSD who has been suffering from rashes from skin allergies. First weeks, it worked pretty well, his licking and chewing on pink paws and legs decreased then it came back. It didn’t work for my GSD, maybe it would work for other dogs, I don’t know. The price was reasonable at first then it goes up almost double than before. My Vet recommended this product when Portia was about six months old, to maintain good coat and skin quality. She is 4.5 years old now and still takes these gel caps on a daily basis and looks great. I purchase them from Chewy.com, because the cost is about half of what my vet charges.